Each inspiring true story of a man or woman who answered God's call is a testimony to a real-life adventure of faith and determination. Betty Greene coaxed her Grumman seaplane to two thousand feet... Suddenly, silence - total silence. The plane engine had stopped! Her passengers gasped, but Betty knew she must remain calm. They had only one slim chance for survival: the twisting jungle river below them. As a young girl growing up on the shores of Lake Washington, Betty Greene had two passions: a love for Christ and a love of flying. 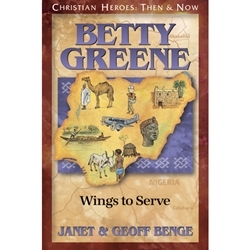 As a young World War II WASP pilot, Betty dreamed of combining her two passions by using wings to serve God.